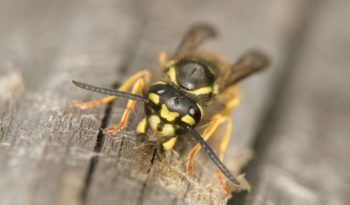 Solitary wasps differ from the Social wasps in nesting habits and life cycle. As they do not have any workers, the queens care for their own young, therefore they usually only have a single nest. Solitary wasp queens use their ability to sting and paralyze prey such as flies, caterpillars and spiders. 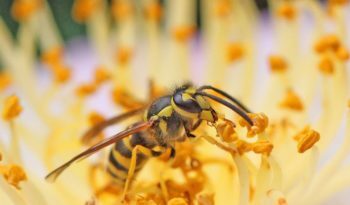 As a result of this, Solitary wasps are not aggressive and rarely sting humans – they will only sting if touched or caught in clothing. 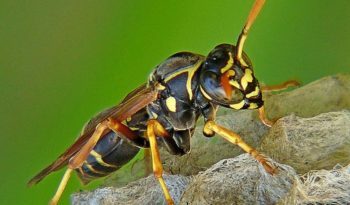 The Mud Dauber wasps are medium to large sized and are either shiny black or metallic blue-black with slender abdomens. They get their name from building their nests out of mud. 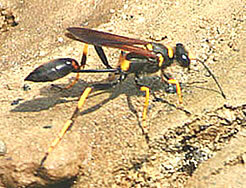 Mud Dauber wasps build finger-like nests of mud which are attached to flat or vertical surfaces. The mud is molded into cells by the wasps mandibles. Their nests are usually built in sheds, barns and other structures. 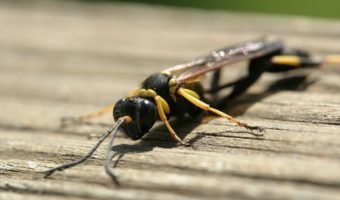 In each mud cell, the queen Mud Dauber wasp will lay one egg and put in a paralyzed spider or other insect and seal the cell. When the egg hatches, the larvae feeds on the captured spider or insect. The larvae matures in about 3 weeks. The larvae will then spin a cocoon to rest in over winter. Male Mud Dauber wasps guard the cocoons while the females forage for more food. Pupation occurs while the larvae is inside the cocoon. 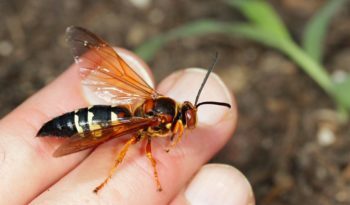 When the wasp is ready to leave the cocoon inside the cell, a female will moisten the clay and clear out any left-over spiders from the cell. She will then lay her own egg and seal it over for metamorphosis to repeat itself. Mud Dauber wasps are mainly found in the US, I think they are rather rare in the British Isles.